Spoiler Warning: If you haven't watched the Season 2 episode of Into The Badlands titled "Palm of the Iron Fox," you might want to turn back now. Besides, as we all know: No one escapes the Badlands. 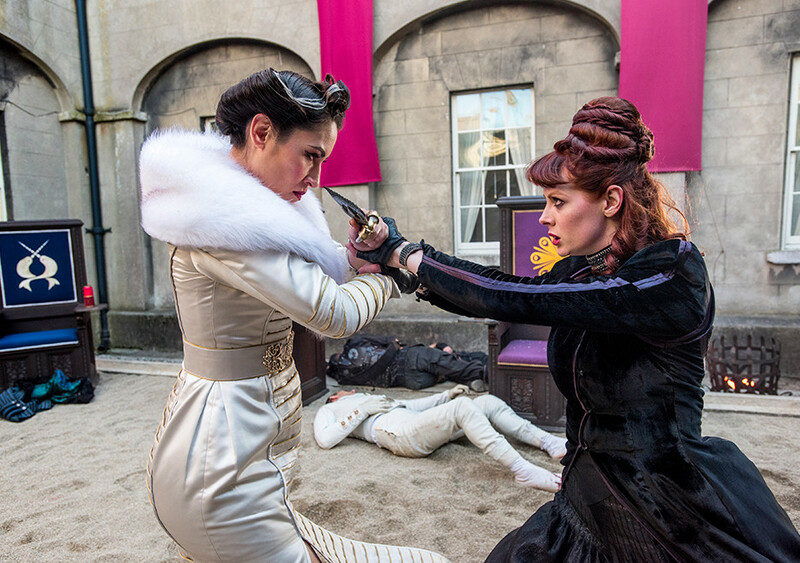 And we’re back with another recap for this week’s episode of Into The Badlands! There’s a lot happening already in spite of the fact that we’re only four episodes in. Previously: Our wayward former Clipper Sunny (Daniel Wu) may be out of the mines, yeah (sung to the tune of T-Swift’s “Out of the Woods”), but he and his new sidekick Bajie (Nick Frost) still have quite a ways to go to make it back to the Badlands - and to Sunny’s lady love, Veil (Madeleine Mantock), who already seems to be planning an escape of her own from Quinn (Marton Csokas) and his Loyalists. (Might be a little easier said than done with newborn baby Henry in tow.) Thanks to some unfortunate acupuncture, M.K. (Artemis Knight) starts to realize that things with the Master (Chipo Chung) aren’t all on the up-and-up. And last but not least, the Widow (Emily Beecham) prepares for her mixer with the other Barons thanks to Ryder (Oliver Stark)’s call for a conclave - which is right where we left off. Apparently, part of preparing for the conclave of Baron involves watching the Widow put on her killer duds. It’s something I’m not opposed to, and neither is Waldo (Stephen Lang) as he rolls into the room to admire the Widow’s look: “If we go down, at least we go down with style.” Cue epic slow-mo walkthrough from the Widow as all of the other Barons - including Jade and Ryder, who seems to literally toast her appearance - look on. Amidst the Widow’s grand entrance Waldo refuses a tray of what passes for hors d’oeuvres from a waiter - one of Quinn’s Loyalists, Gabriel, in disguise. Looks like we may have a clue about what Quinn’s big mission is after all. The Widow makes some particularly chilly small talk with Baron Chau (Eleanor Matsuura), and while there’s some innuendo that gets tossed around you’ve got to admire the way these two ladies really just get straight to the point with one another. Unfortunately, if the Widow wants the conclave to go her way she’s going to need Chau on her good side - Waldo informs her some of the other Barons are already planning to vote in Ryder’s favor, so for once the Widow might have to play nice. Ironically, we haven’t seen hide nor recently-shorn hair of Sunny yet, but Veil isn’t going to wait around to be rescued. She’s found time to fashion together a rope and a hook, and once Edgar lets her and baby Henry into the ventilation room she tosses the rope up the shaft to begin her escape. She only makes it up about halfway before Edgar comes looking for her, so to throw him off the scent she pretends to be nursing Henry. The surprise of seeing unexpected breastfeeding is enough to make Edgar scamper away like a bunny, but Veil’s more than a little discouraged. Chalk one up in the failed escape column. Against the Master’s directive (and probably against his better judgment), M.K. heads back into the mirror room to pursue the earlier vision he’d had of his mother calling out to him. This time around, he manages to locate her - but she’s already dying, taking a moment to forgive him for what he’s done. M.K. doesn’t completely understand what’s going on until his dark-eyed doppelgänger shows up and informs him he’s responsible: “Look in the mirror; you’re the one with blood on your hands.” Angered by the response, M.K. tries to challenge his Bizarro twin, but one devastating kick to the chest leaves him unconscious in the vision - and unconscious back in the room of mirrors, with no one to pull him out this time. Quinn receives a message via dove from Gabriel giving him and his men the all-clear to crash the Baron party, but since there’s always time for a little introspection he takes a moment to consider the state of things. He admits that while Ryder has usurped him as Baron, he had raised his son to take power - and he did. There’s a lot going on here: Quinn clearly feels betrayed to a certain degree, but also… infused with fatherly pride? It’s a tough dichotomy to pull off, but it’s a reminder that Marton Csokas is doing masterful work on this show. If Veil can’t escape one way, leave it up to her to figure out another. It’s almost heartbreaking to watch the moment Edgar realizes Veil has put something in his drink, but fortunately it’s only a sedative and not poison. With her guard effectively put to sleep, Veil runs to fetch Henry and get the hell out of Dodge. What follows is basically the embodiment of things going from bad to worse. She makes it all the way to the front gate - only to discover it locked. She tries to break the lock with a crowbar - but Edgar subdues her, having woken up from his sedation. She hits Edgar with a rock and grabs the keys from his belt - but Edgar recovers and comes after her again. Only when Veil whacks him in the head with the crowbar does he finally go down for good, but when Veil returns to the lock she discovers that one of the keys has broken off inside it. It’s heartbreaking to watch Veil look this defeated, as she slumps down the wall inches away from freedom with Henry crying a short distance away - but you still want to root for her too. Come on, Veil! Don’t give up! The Widow requests a one-on-one with Chau to discuss the potential for an alliance. When it comes to the Widow’s plans to annihilate the class structure of the Badlands, Chau isn’t feeling it. The Widow’s industry might be oil, but Chau’s is labor - essentially, the cogs themselves - and a cog-free world would mean the end of her existence. For the Widow, however, shaking up the structure of the Badlands isn’t merely based around a desire for justice; it’s personal. We learn in this moment that she was once a cog, crammed tightly among other cogs in one of Chau’s pens at the age of 13. “Don’t lecture me on the virtues of the system, because I’ve experienced it firsthand.” And yet, Chau reminds her, she’s ascended - as did Quinn, who was once a cog himself: “The strong always rise to the top.” Chau doesn’t agree with the Widow’s methods - or the fact that she’s providing a sanctuary for runaway cogs - but the alternative is war, and she doesn’t want that either. If the Widow promises to stop sheltering fugitives, Chau’s vote is hers. Cut to the conclave. The Widow pleads her case and points out (pretty logically) that she shouldn’t have to make amends for taking back the oil fields that technically belonged to her in the first place. When Quinn stole the territory from her, none of the other Barons made a peep. It seems like the Widow has a hard time getting the other Barons to take her seriously, especially since she assumed the role from her late husband rather than by another means of ascent. The Widow: You’re going to take my lands over my dead body. And in case you thought this conclave wasn’t going to get crazier, think again: Gabriel’s just opened the gates for Quinn and his Loyalists to serve up even more chaos from within. Understandably, everyone’s a little surprised to see Quinn still alive - including Ryder, who staggers back at the sight of his father. Oops. So much for bragging that you killed your own dad, buddy. Rather than engage with Quinn on a fighting level, Ryder chooses to turn tail and run away instead, which leaves the Barons in an all-out brawl not only against each other but against Quinn’s Loyalists as well. The Widow and Chau finally have it out (who knew stilettos could be so deadly? ), and when Waldo finds himself at the pointy end of a knife wielded by one of Ryder’s Clippers, he’s saved by none other than Tilda and one of her throwing star butterflies. After this, Tilda’s likely only going to get a mild scolding for disobeying her mother’s orders - especially once she tosses the Widow a sword to help her in her showdown with Chau. Realizing she’s outnumbered, Chau retreats to fight another day (thereby providing the hope that we’ll get to see her again, hooray!). Quinn tracks Ryder through a hedge maze to the statue at its center, and while the son hasn’t quite eclipsed the father in terms of swordplay, Quinn notes that Ryder’s fighting spirit is is stronger than it once was. Even after he disarms Ryder, Quinn gives him the chance to seize power the honorable way, offering his sword to his son. When Ryder doesn’t take it, Quinn shatters the blade against the statue instead. Try as they might, neither of them can manage to kill each other when the opportunity arises; Ryder falters as he wields a piece of the blade in his father’s direction. “Take what’s yours,” Quinn urges, but Ryder’s hesitation ultimately proves to be his undoing as Quinn forces the blade into his son’s chest, cradling him as they sink to the ground. “Why’d you hesitate?” Quinn brokenly demands, but the answer seems obvious to Ryder: “You’re my father.” “You’re my son,” Quinn whispers, leaving Ryder at the foot of the statue for Jade to find while he makes his exit. This may be one of the BEST EPISODES I've seen of 'Into the Badlands'! Where do I start? You know it's a great show when you know it's TV but you're genuinely "on your seat" scared for certain characters lol. Veil's various attempts to keep secrets from Quinn and escape attempts keep you on edge the entire time. You find yourself screaming at the television and telling her to "HURRY UP!". That storyline is particularly interesting because you know there will be a reunion with Sunny, and you wonder whether she'll be free or under the thumb of Quinn. It's going to be super exciting to see how that plays out. Now on to the main course for tonight's episode, which is the conclave with the Barons. The Widow is in deep and she and Waldo both know it. There's one of two plans: a) Reason with the Barons or b) KILL THEM ALL. This makes for a super exciting premise, as we know there's going to be suspense and deception after deception. The face-off with the Widow and the Barons doesn't disappoint! The Widow is exactly what Waldo told her to be: fearless. She tells the entire lot of proficiently skilled Barons that they'll have to force her out over her dead body. As that battle is about to ensue, the icing on the cake arrives, as Quinn and his Clippers crash the party! The look on everyone's faces at the revelation that he's alive is PRICELESS. You can see the intrigue on everyone's faces as they contemplate in that split second of what his return means for each of them. The most afraid, Ryder cowers and jumps through a window to escape. Obviously Quinn has no time for nonsense and orders the slaughter of EVERYONE, as he goes after Ryder. The ensuing battle is played out like a cinematographer's dream as we get scene after scene of the slaughter we've come to expect from the show. The Widow and Chau's fight is amazing and the fact that they both lives foreshadows a forthcoming showdown that we can't wait to see! All in all, Great job, and we can't wait for next week! The Walking Dead (AMC) Promo & Sneak Peek - "Forget"
Into the Badlands (AMC) Talked About Scene - "Father vs Son"
YES!!! Great take on this episode! It was a battle royale! Chicago Fire (NBC) Full Episode - "Purgatory"